Have you ever thought about your own life with climate change? For example – the things you eat, the things you wear, the places you go to, where you live – have you ever wondered how these are and will be affected by climate change, or how you may be contributing to making things better or worse? Difficult isn’t it? But, whether you recognize it or not, massive changes are underway in our own backyards. Problem 1. Climate change itself: many scientists, organizations and publications describe it as the most serious crisis mankind has ever faced. Problem 2. The lack of effective action to address Problem 1. We need to overcome Problem 3 to solve Problem 2 and thus take care of Problem 1. 3, 2, 1 – Sounds simple enough, right? Well, it is all but simple. Global carbon emissions are rising every year. The gap between political rhetoric of sustainable development and day-to-day action is ”scandalously wide” (Foster, 2008). The gap is most pronounced in consumer behavior: the purchasing and consumption of food, energy and goods have been largely unaffected by slowly rising awareness of global climate change. Why has there been so little effective response so far, despite the overwhelming information currently available on climate change? Part of the answer is the failure of many governments at all levels to act decisively on major incentives and penalties influencing behaviour and the economy around mitigation and adaptation to climate change. In many countries, for example, the rate a person pays for electricity actually goes down as their consumption goes up, instead of the reverse. In this case, people are being rewarded for using more electricity and increasing their carbon footprint. Perhaps you can you think of a few examples like this in your own community…. Of course, it doesn’t help help that governments, companies, and the media often fail to reinforce desired policies and behaviours, sending mixed signals…. Source: The Telegraph, 22 April 2009. Copyright Telegraph Media Group Limited 2009. For example, this news clipping reveals a major policy disconnect: one article speaks of the latest political initiative to “slash” carbon emissions, while the adjoining piece celebrates measures to boost oil and gas production. But a major obstacle is the attitudes and priorities of the public themselves, our social norms and practices which are resistant to change. It is hard for us to connect with climate change, to see the signs that it is happening, to grasp how it may change the way we live. As described in our last blog post, climate change is often represented to the public in the form of melting ice floes, scientific charts and global temperature maps – things which are hard to translate to real life. In this blog, we argue that a major driver for change is for people to see others taking climate change seriously in their own neighbourhoods. In spite of what government is or is not doing, we can encourage thoughtful and collective climate action among citizens and voters at the neighbourhood scale, through a change in the way we see our local landscapes and motivate action within them. 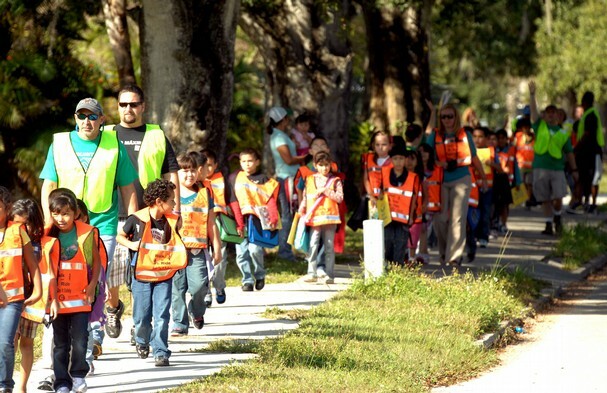 The walking school bus: a great example of initiative taken at the neighbourhood level to reduce car use, resulting in lower carbon emissions and higher community connectivity with the landscape. Source: tcpalm.com. But how exactly? Stay tuned for the next blog posts! We will explore new ways of looking at our communities through a climate change lens, and explain principles and techniquesfor applying visual media to your own local landscape, in order to galvanize local discussion and perhaps action. References Foster, J.M. (2008) The Sustainability Mirage, Earthscan, London.